Yes, officer, I saw the budgie bandit. He went that way. Your feathery friend loves to learn new things. Perching on your finger will be a fun thing to learn for you both. A skittish parakeet will need to be trained to hop onto a wooden perch before she tries to hop onto your finger. Start every training session by preparing her environment. For the first few weeks you'll refrain from trying to handle a new parakeet. You start by building trust. She has to know that you are her provider, that you are going to keep her safe and provide for her needs. This is important as you begin training her to perch on your hand. Get her used to your presence and voice. Approach her cage slowly and speak to her softly always. Treating her tenderly as you maintain her cage lets her know over a period of a couple weeks or so that she is safe around you. Your parakeet is getting used to your hands as they enter her cage as you change her water and food. This is vital -- she’ll need to learn to associate your hands with food, water and play time. When it’s time to start training her to perch on your finger, do so at a time when you are going to change her water and give her fresh food. Keep your hand in her cage for a few minutes after you have given her fresh food and water. Just keep your hand still inside her cage, letting her get used to its presence in her home. Talk to her in a calm and soft voice. Do this daily for a few days before you start training her to hop onto your finger. Close the blinds and make her room a little dim. Bring a portable CD player into the room and play some soft music at a low volume so she stays calm. Open her cage to give her fresh food and water just like you do every day. Just as you have done on previous days, speak softly to her so she knows you’re a safe person. Expect her to fly away from your hand the first few times you put your hand into her cage for a training session. Just keep working with her until she doesn’t become frightened. Work with your parakeet every day, showing her she can trust you and your hand. Continue to combine this training with changing out her water and giving her fresh food. She loves millet, so add some to her cage with the hand you want her to hop onto. Detach one wooden perch from her cage and nudge it against her legs or chest. Say “Up” as she hops onto the perch. Praise her every time she hops up to the perch. Repeat this for several days until she’s comfortable hopping onto the perch. Prepare your training environment as you have in previous days. Talking softly to your bird, detach the wooden perch from her cage and place your forefinger on top of the perch. Gently nudge the perch and your finger against her chest or legs and say “Up.” She should hop on, landing either on your finger or the wooden perch. Keep practicing this part with her for several days – she will enjoy landing on a soft, warm finger. Every time she hops onto your finger, give her lots of praise. 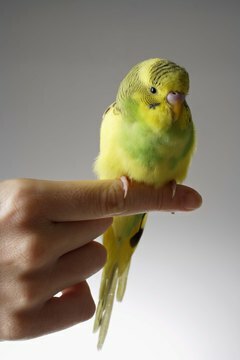 Now that your little bird has figured out that your finger is more comfortable than a hard wooden perch, get her used to hopping onto your finger. Continue practicing with her every day, using the same calming environment and soft, gentle voice that you’ve used in training her. Press the side of your finger gently against her chest or legs as you say “Up.” Praise her when she hops onto your finger. She’ll thrive from daily contact with you, as long as she is treated lovingly. Ensure her good health by washing your hands before she gets finger-perching time.